Dr. Alan Goldberg is a Professor in Environmental Health Sciences at The Johns Hopkins University Bloomberg School of Public Health as well as Founding Director (Emeritus) of The Johns Hopkins Center for Alternatives to Animal Testing. In addition, he is Principal of Global Food Ethics at Johns Hopkins University. Alan received his B.A. in pharmacy from the Brooklyn College of Pharmacy. He spent a year at the University of Wisconsin working as a predoctoral trainee in Pharmacology before beginning his Ph.D. at the University of Minnesota. Alan conducted postdoctoral research and then served on the faculty at Indiana University before joining the faculty at The Johns Hopkins University in 1969. 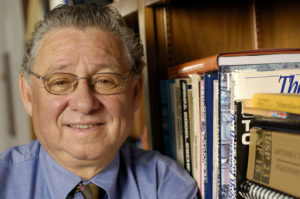 He has received numerous awards and honors for his accomplishments including being named a Member of the ALEXANDRA Project, Monaco, as well as receipt of the Lifetime Dedication Award, Korean National Center: Patron of the 3Rs from the Alternatives Trust at the 7th World Congress , The State of Maryland Governor’s Citation, the Doerenkamp Zbinden Foundation Award, Society of Toxicology Enhancement of Animal Welfare Award, Ambassador of Toxicology Award from the Mid-Atlantic Society of Toxicology, an honorary doctorate degree from Long Island University, the Distinguished Alumni Award from Long Island University, and he was the first recipient of the Humane Society of the United States’ Russell and Burch Award. In this interview Alan shares more about his life and science. In his free time, Alan enjoys traveling, going for walks, being out in nature, and visiting farms. He has been able to travel to many places because of his science, and some of his favorite destinations are in the Netherlands, Italy, and Asia. Alan is developing a program that will allow foods that have been produced ethically to be certified. They are also creating an associated information program that will act as a template for industry to enhance their efforts related to food ethics, as well as serve as a consumer information database that will help informed consumers find out more about the ethical issues they are interested in related to different food products. These ethical issues include environmental and resource conservation, labor and small holder farms, animal welfare, and public health and well-being. They will be able to certify foods based on these categories and help people in industry understand how to meet these standards. From a very early age, Alan aspired to be an electrical engineer. He never considered any other career alternatives because he felt so certain that becoming an engineer was the perfect path for him. Alan started college at an engineering school, but he quickly realized this was actually not what he wanted to do. At the end of his first year, Alan told the dean of the college that he wasn’t sure what he was going to do next, but he would not be returning the next year. When he got off the bus on the way home, Alan looked at the drugstore in front of him and had a stroke of inspiration. He began wondering what it would be like to conduct research on different medicines. Alan applied to pharmacy school where he met an influential mentor who got him involved with research and helped set him on the path to becoming a scientist. About ten years ago, Alan was invited to serve on a national commission to review industrial farm animal production in terms of animal welfare, public health, social justice, and the environment. Through this experience, it became clear to him that the food system in the U.S. produces huge amounts of food at very low prices but with very high ethical and health costs. Alan wanted to change the system, and it quickly became clear that it would be necessary to start this change at the level of the consumer. When Alan first spoke with one of his colleagues about his plans, the individual told Alan that he was trying to do the impossible. He then offered to help. They are now one and a half years into the program, and there have been many challenges along the way in terms of communication, working with different groups, and getting all the pieces together, but they hope to launch the program to the public by November of next year. Alan has worked in five different areas of science over the course of his career, and he has had exciting successes across these different areas. He developed an assay that could detect very small amounts of the neurotransmitter acetylcholine. In addition, Alan helped lower the allowable threshold for lead content by demonstrating the toxicity of smaller concentrations of lead, especially for children. He also helped transition the cosmetic industry to a non-animal based approach to toxicity testing. Another big success was helping develop informational training programs on HIV for NBA basketball players. Alan has been traveling to the Netherlands for his work at least once each year since the mid 1970s. He has lived there before as well, so this is one of his favorite places to visit. The herring there is fantastic, and the first thing Alan does when he arrives is find a local herring stand. Italy is another country Alan has visited several times, and it is a wonderful place to experience people and food (especially the pasta). When he is in Asia, one of his favorite foods to order is green papaya salad. In his first week as a postdoctoral fellow, Alan was working in a laboratory trying to learn microchemistry. At that time, the lab had to make their own micropipettes using glassblowing. Alan was having a terrible time getting these pipettes to work for his experiments. When he finally said something to a labmate, they confirmed that it wasn’t just Alan. It turned out the lab technician had been giving Alan all the broken pipettes as a prank since he was new to the lab. It is a great world, and it is great because of the people who live here. We have to be open to new experiences, move forward even if we’re not comfortable, celebrate diversity, share knowledge, and be appreciative. In 2007, Alan was appointed to the Pew Commission on the Impact of Industrial (US) Farm Animal Production that examined issues of public health, environment, animal welfare and social justice. While on the commission, Dr. Goldberg studied with the Talmudic Scholar Rabbi Avram Reisner to learn the Jewish laws dealing with food animal production. At the request of the Committee on Jewish Law of the United Synagogue of Conservative Judaism he shared his understandings of farm animal welfare. Dr. Goldberg also chaired the management board of Orange House Partnership, a Belgium NGO dedicated to provide training on food safety to the developing world. This was the stimulus for his interest in Ethical Food Issues. The Center for Alternatives to Animal Testing at Johns Hopkins was founded in 1981, and Alan was the Founding Director for 28 years. The Center works with industry and government to incorporate the latest technologies and the most humane science in product safety decision-making. The Center also supports the development of new in vitro methods and refinement alternatives that contribute to basic research, product development, and regulatory decisions. In addition, it provides education to scientists on how one practices the most humane science, aka – the 3Rs of alternatives – refinement, replacement, reduction. Alan has served in several Administrative positions at Johns Hopkins. He was The Associate Chair of the Department of Environmental Health Sciences, Director of the Division of Toxicology, and an Associate Dean (15 years) at the Bloomberg School of Public Health. As a Dean, he was responsible for Research with specific responsibility for technology transfer, conflicts of interest, and working with the private Sector. He is the author of more than 150 scientific articles and editor of numerous books.